A MINISCULE 0.7% is all that stood between the merger of Bagenalstown Credit Union and an uncertain future at an extraordinary AGM last Thursday night. 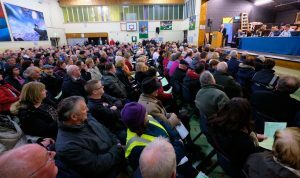 It was standing-room only at Presentation de la Salle College as an unprecedented 537 members of the credit union turned out for the annual meeting, specifically to vote on the proposed merger with St Canice’s Credit Union in Kilkenny. A significant margin of 75% of the vote was required for the merger to be carried and following a secret ballot and a tense count, the result was a nail-biting 75.7% in favour of the merger. “It’s a big relief,” admitted Richard Dwyer, manager of Bagenalstown Credit Union. “The staff put so much effort into this, it would have been a blow for us if the merger hadn’t got ahead. The fact that 537 people turned out for an AGM is just incredible for any credit union; we were hugely impressed by the numbers who turned out last Thursday and how important the credit union is for our members. “There was a lot of misinformation out there and staff put in a huge amount of work over the past few months to inform and reassure our members,” he said. A scheduled AGM for Bagenalstown Credit Union at its offices in December had to be postponed, such was the huge volume of members present. Demand for seats was equally as high at Thursday’s AGM in the bigger venue, the huge volume of people creating a warm and at times uncomfortable atmosphere, with one member unfortunately fainting in the unpleasant conditions. Among members’ concerns about the merger was the loss of local control and loss of identity, with some people fearful that Bagenalstown would be swallowed up by the larger St Canice’s Credit Union. However, the highly respected, long-standing staff in Bagenalstown were quick to offer their assurances. “We genuinely felt confident the merger would be successful. We’re not under any pressure financially, but our costs are rising and if that trend continues we could have ended up in a situation where our costs would have matched our income,” said Mr Dwyer. “Once the result was announced, it was generally accepted, because three out of four people in attendance welcomed the result,” said the Bagenalstown CU manager. Mr Dwyer is confident the merger will create a stronger and more efficient credit union to serve the combined membership across the wider catchment area. The new entity will have combined assets of more than €400 million and 60,000 members. “I am confident that the decision to join forces with St Canice’s is the right one and will allow us to continue to provide an efficient and effective service to all our members,” said John Devine, chairperson of the board of Bagenalstown Credit Union. Bagenalstown members have been assured that their savings and loan accounts will be unaffected by the transfer and they will see no change in the day-to-day operation of the credit union. Staffing has been unaffected by the merger. There is now a 21-day representation period, after which it is envisaged that the two credit unions will become one strong credit union. In the meantime, it will be business as usual for both.